“Show me a denarius,” said Jesus. A denarius was a dime-sized silver coin that was an Imperial Roman coin meant to circulate throughout the Empire. Since Jews under the Romans were not permitted to mint silver or gold coins, they had to use Imperial coins. A denarius (a ten-assarius denomination) was a day’s wage for a common laborer in the time of Christ. 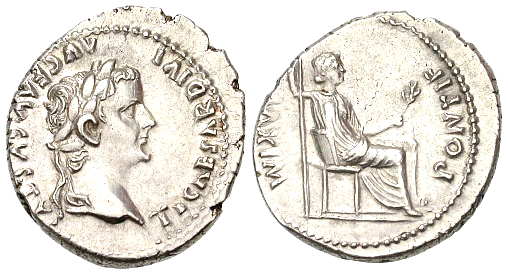 Roman taxes were collected in Imperial coinage. Those asking Jesus whether it was “lawful” to pay taxes to the Romans were trying to trick him into saying things that could possibly be considered treasonous. The denarius of Tiberius shows his bust on the obverse, with his adopted mother Livia (Augustus’ widow) on the reverse personifying “Piece” (Pax). Tiberius had been named “Pontif[ex] Maxim[us]” by the Roman senate, which is a title for the chief priest of Rome. This coin was minted to mark that event: the title means “great bridge-builder.” Today’s Catholic pope continues the title from those ancient days. The obverse superscription says in Latin: TI CAESAR DIVI AUG F AUGUSTUS. Translated it means: “Tiberius Caesar Augustus, son of the divine Augustus.” Since “Augustus” could be translated as “Magnificent,” Tiberius claiming the title of his adopted father. Thus he was saying he was “Magnificent Tiberius, son of god (Augustus Caesar was declared a god!). When Jesus said “render to Caesar” his things, made in his image, He also said “render to God” the things in HIS image…that would be us.